Internet access for smartphones, tablets, and other mobile devices is no longer a luxury for business patrons – it’s a necessity. But there is much more to providing reliable, high-speed, high-density wireless access in outdoor environments than simply sticking an access point on the wall. Due to the harsh conditions characteristic of outdoor environments, such as fluctuating temperatures and constant exposure to moisture and dust, typical indoor access points are not suitable for outdoor deployment. Outdoor access points are specifically designed to withstand the rigors of harsh environments and carry an IP (Ingress Protection) rating that certifies the level of protection the AP possesses against solids and liquids. Since you’ll be mounting the access points outdoors in locations that are likely nowhere near a power outlet, make sure your APs support Power-over-Ethernet (PoE), which enable the AP to draw electrical power through the network cable. Using shielded CAT5e or CAT6 cable will prevent electromagnetic and RF interference from degrading the performance of your network. By deploying dual-band access points, you can optimize network performance and user experience by employing features such as band steering, which automatically directs 5 GHz-capable devices such as smart phones and tablets to the less-congested 5 GHz band. This decreases the load on the often-saturated 2.4 GHz band to improve network performance for legacy devices such as network printers and point-of-sale (PoS) systems. Also, dual-band access points can support more users in high-density environments. Mount the APs out of reach to keep people from tampering or defacing the units. Mount the AP high enough for the signal to travel over any obstructions such as plants or outdoor furniture. Make sure that the AP is securely mounted to keep it from being dislodged by wind or other weather elements. Make sure to ground the AP to protect it during lightning storms. Using an inline Ethernet surge suppressor between the AP and your wired network is generally recommended. Set the transmit output power level at a medium level, such as 17 dBm on the 2.4 GHz band and 23 dBm on the 5 GHz band. If the power level on the AP is set too high, many mobile client devices could be far enough away from the AP that they do not possess enough transmit power to talk back to the AP. It may be desirable to paint your access points so that they’ll blend into the surroundings, but carefully consider the type of paint you use. Only use non-metallic paint, as metallic paint can act as an antenna and distort the coverage. Also, realize that painting the AP a dark color may cause it to heat up faster when exposed to the sun. APs with internal antennas are generally considered more aesthetically pleasing, but an AP with removable external antennas gives you the option of adding higher-gain antennas for longer ranges. APs are available with directional or Omni-directional antennas, and the type you select will depend on your desired coverage. In general, APs with directional antennas will focus the signal in a particular direction, and thus reach further out than Omni-directional antennas. 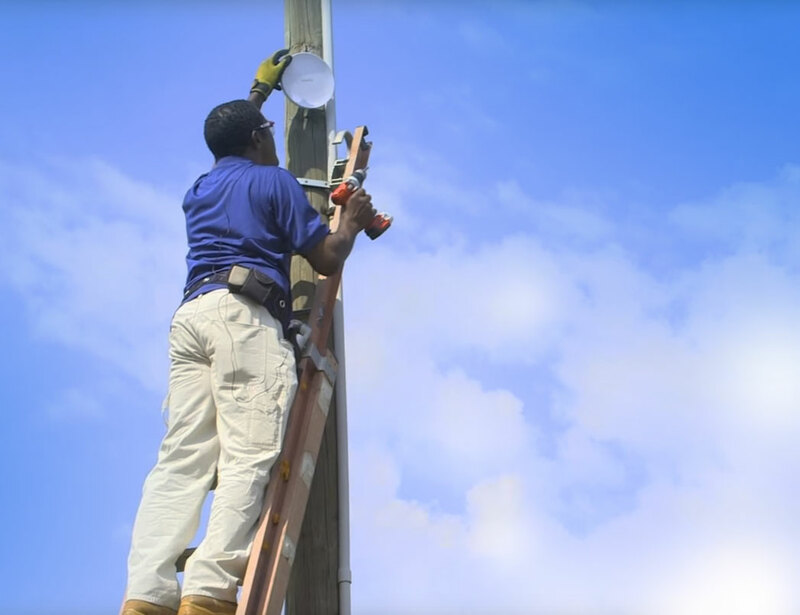 Using network cable for connectivity to the network backbone, otherwise known as backhaul, is always best, but sometimes using a dedicated wireless backhaul link is necessary. We recommend using a separate, dedicated Point-to-Point (Pt.-to-Pt.) link for backhaul on an independent channel, then cross-connect the Ethernet port of the backhaul link to the Ethernet port of the AP rather than sharing the resources of the 5 GHz radio in the dual-band device for backhaul.